West Virginia Democratic House candidate Ralph Baxter is running as a "4th generation West Virginian" and "West Virginian jobs creator," but he does not mention on his campaign website that he owns property, worth almost $2 million, in House Minority Leader Nancy Pelosi's (D., Calif.) neighborhood in Napa County, California. Baxter grew up in West Virginia during his early years, but he moved to California with his parents when he was in fifth grade and only lived in West Virginia periodically over the course of the following six decades. He received his bachelor’s degree from Stanford University in 1968, a master’s degree in education from the Catholic University of America in 1970, and a law degree from the University of Virginia in 1974. After graduating from UVA, he started working at the San Francisco-based law firm Orrick, Herrington and Sutcliffe and ultimately served as the firm's CEO for 23 years until his retirement in 2014. When he served as the CEO, he lived north of the San Francisco office in Napa County. In 2002, after Baxter was successful in pushing his law firm to open up an office operations center in Wheeling, West Virginia to cut down on administrative costs, the candidate also bought a home in the area, according to Law.com. Baxter, nevertheless, spent most of his time traveling or living in Napa County. "Now back then I basically lived full-time on United Airlines," said Baxter, joking about the hectic travel schedule. "But I spent as much time as possible [in Wheeling] and my family loves it here." While Baxter moved to Wheeling in 2014 after retiring from Orick, he and his wife, Cheryl, still own the Napa County property in Pelosi's neighborhood, according to property records. Baxter sided in 2014 with Pelosi's husband, Paul, on a neighborhood dispute over a 30,000-gallon winery project the Pelosi's proposed. "Paul Pelosi, the husband of Congresswoman Nancy Pelosi, D-San Francisco, has been organizing neighborhood opposition to a proposed 30,000-gallon winery project that’s planned for the corner of Silverado Trail and Zinfandel Lane near St. Helena," the Napa Valley Register reported at the time. The Pelosis own the property next door to the winery, which will be called Castelluci Family Winery. Paul Pelosi told the Napa County Planning Commission last week that he’s concerned about the impacts traffic to and from the winery will have on Zinfandel Lane. The main driveway in and out of the new winery will be off of Zinfandel, and the winery planned to install a left-hand turn lane off the eastbound lane to ease access. The use permit request for the winery seeks up to 50 visitors per day and 300 weekly as well as marketing events. Baxter sent an email to Napa County Deputy Planning Director John McDowel on April 14, 2014 saying he supports "Paul Pelosi’s request for a continuance of the Permit Application in the above referenced matter." "My wife and I own the property at 33 Zinfandel Lane, just across the bridge from the Castelluci property. 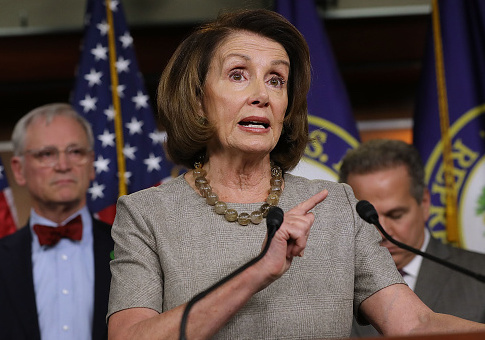 While I have no firsthand knowledge of the proposed project (nor to my knowledge have been sent any notice of the upcoming hearing), from what I have heard, I share Mr. Pelosi’s safety concerns," Baxter wrote. "It certainly would be best if all of the neighbors had a chance to examine the project and express their views to the county before the permit and variance issues are decided." Baxter has not said whether he would support Pelosi for House Speaker if he were to win election and Democrats take control of the House in November. National Republican Congressional Committee spokesman Chris Martin slammed Baxter for "trying to deceive" West Virginians. "Something tells me West Virginians won’t take kindly to Nancy Pelosi’s next-door neighbor trying to deceive them," Martin said in a statement to the Washington Free Beacon. Baxter is running to unseat incumbent Rep. David McKinley (R., W.Va.) in the state's 1st Congressional District. This entry was posted in Politics and tagged California, House Democrats, Nancy Pelosi, West Virginia. Bookmark the permalink.